Yesterday Ms. Meghan Markle was married to Prince Harry in a service at St George's Chapel inside the grounds of Windsor Castle. Among the guests were 2200 members of the public, the royal family and Ms. Markle's Mother Doria Ragland. Prince Harry is now the Duke of Sussex and Meghan is the Duchess of Sussex. Early reports describe how "simple" Meghan's look was. But there was absolutely NOTHING simple about the tiara she wore. The tiara which has been valued at more than $100M is made of diamonds set in platinum. It was crafted by expert jewelers and features a center detachable brooch made of ten diamonds dating back to 1893. The diamond tiara was a present to the then Princess Mary in 1893 by the County of Lincoln on her marriage to Prince George, Duke of York, who would become King George V. The tiara was passed down by Queen Mary to The Queen in 1953. The queen’s sister Princess Margaret famously wore the piece to events. 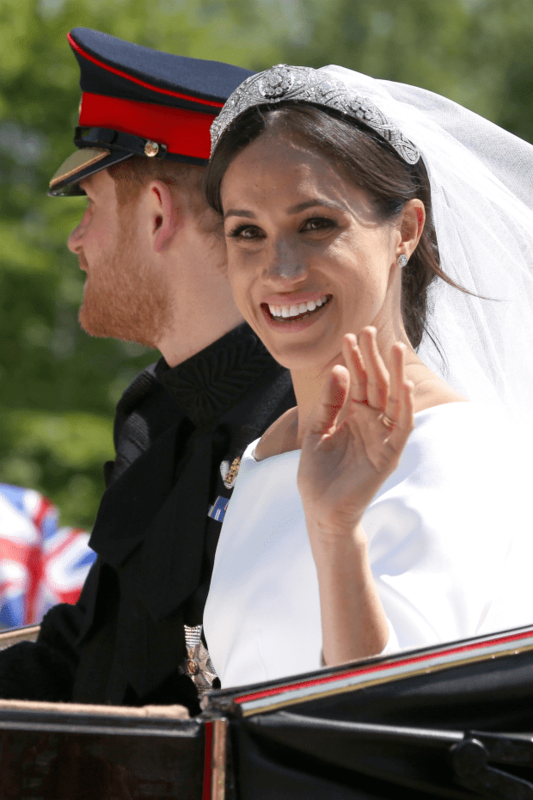 The couple exchanged rings at the altar at St. George’s Chapel in Windsor Castle, but Meghan debuted a new piece of jewelry while on her way to their evening wedding reception . PEOPLE confirms Meghan wore Princess Diana’s aquamarine on her right hand which was visible while she waved at photographers as she sat in the silver-blue Jaguar E-Type Concept Zero Harry was driving.